The scene of the accident early Sunday morning. Trains were not running at the time of the accident. Photo: Metro. We’ll be updating this post throughout Sunday and Monday morning with new information at the top of the post. UPDATE, 5:25 a.m. Monday: Repairs completed earlier this morning. Regular rail service in both directions restored for this morning’s commute. UPDATE, 10:10 p.m.: Repair work on the overhead wires continues. Metro is working on a plan to provide the maximum amount of Gold Line service if repairs can’t be finished in time for the Monday morning commute. Rail service is running Union Station and Allen and between Arcadia and APU/Citrus College in Azusa.Bus shuttles are running between Allen, Sierra Madre Villa and Arcadia stations — and would continue to do so Monday morning if rail service can’t be restored.Please see service updates on Metro’s Twitter stream for updates; we’ll also continue to update the blog. Foothill Transit’s 187 Bus provides service between the Foothill Cities and Old Pasadena — please click here to see the route and schedule. Foothill Transit’s 496 bus also provides express service between the Gold Line’s Azusa Downtown Station, Covina and downtown Los Angeles for those who want an alternative to the Gold Line. UPDATE, 5:45 p.m.: As you’ve likely heard, Metro had to shut down power on the tracks between Allen Station and Aracdia Station due to a truck that crashed on the 210 freeway during heavy rains about 3 a.m. Sunday morning. 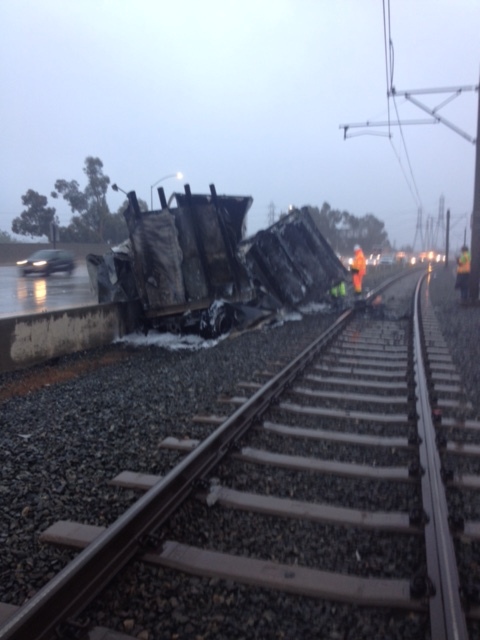 The truck struck the barrier between the freeway and the Gold Line tracks near Sierra Madre Villa Station. After an inspection, Metro determined some repairs were required to the Gold Line. The heat from the truck fire stretched the overhead wires that provide electricity to trains — requiring the splicing of new wire and some other repairs. A few insulators along the track were also damaged. They have been replaced. Metro is trying to complete the work tonight in order to resume regular Gold Line service Monday between Union Station and Azusa. As soon as we know about the status of the Gold Line for Monday’s commute, we’ll let everyone know. In the meantime, Gold Line trains are running on their Sunday schedule between Union Station and Allen Station in Pasadena. Bus shuttles are running between Allen, Sierra Madre Villa and Arcadia stations. Trains are also running between Arcadia and APU/Citrus College Station in Azusa. UPDATE, 3:50 p.m.: Two freeway lanes remain closed as repairs continue, buses replace trains between Allen-Arcadia stations until further notice. UPDATE, 10:21 a.m.: Bus shuttles continue to replace Gold Line service between Allen, Sierra Madre Villa and Arcadia stations. Caltrans is also reporting the three left lanes on the westbound 210 freeway will remain closed until 3 p.m. Cranes are on the scene to remove the remains of the truck. Gold Line service is running every 15 minutes between Arcadia and APU/Citrus College stations and every 15 minute between Union Station and Allen. More details below. An accident on the westbound 210 freeway in Pasadena occurred this morning about 3 a.m. The overturned tractor trailer and accident debris are currently blocking Metro Gold Line tracks and train service between Allen and Arcadia stations is currently replaced by bus shuttles. Please allow extra time if traveling through affected area. Follow announcements at the stations. Trains are running every 15 minutes between Union Station and Allen Station and every 15 minutes between Arcadia Station to APU/Citrus College Station. If looking for an alternative one-seat ride, Foothill Transit’s 187 Bus runs between Azusa and Old Pasadena with stops in Duarte, Irwindale, Monrovia and Arcadia. The California Highway Patrol and Caltrans are investigating the incident. A crane to remove the tractor trailer cannot be called in until at least 1 p.m. due to the heat still emanating from the tractor trailer. We will have an update later this afternoon as to what repairs, if any, Metro may need to make to the tracks and power systems, and whether this will impact service through tomorrow morning. Metro advises all customers to be especially careful due to the rainy weather. Please do not run to catch your bus or train. Motorists should keep headlights on and travel at reduced speeds where necessary. Follow Metro on Twitter @metrolosangeles and @metrolaalerts for up-to-the-minute updates on information and announcements. Didn’t anyone foresee this when the Gold Line was on the drawing board? When the Santa Fe Railway used this line it was single track and there was more room for highway mishaps. It’s high time that METRO spends some “gold” building a safe and sturdy barrier along the 210 Freeway. Next time a Gold Line train with its riders may be hit! It’s crazy when you look at the previous Source posts and realize that this kind of thing actually happens pretty regularly on the Gold Line. Maybe it is justified to further fortify the barrier between the freeway and the tracks. People are terrible drivers, especially in the rain. It’s worth remembering that north of 32,000 people die in vehicle crashes in the United States every year. I hope Metro pursues aggressive legal action against the responsible driver. These repairs should not be on the taxpayer’s dime. Why in the world was the big rig in Lane 1 or, worse yet, the carpool lane? Didn’t the truck driver know he is supposed stay in the two right-hand lanes and drive at or below 55mph? He wasn’t! The freeway makes a large right turnout this point. The truck continued straight. It is possible the driver fell asleep or was driving too fast and hydroplaned across all lanes. As far as the height of the barrier, I think it is high enough. The truck went through it.One think that is needed is resurfacing the 210. When it is raining there are huge poodles forming. It is really surprising and people lose control, especially in these turns. I commute on this freeway and I see at least one accident a day. It grew over time and now it is unsafe. In the carpool lane there is no room for any mistake. Add to that uneven surface and water and this is what you get. It’s easy to blame the poor driver and not the regional planners who extended this freeway east but did not upgrade the old parts to be able to take the new load safely. The real question is why do stupid people think they can speed in the rain. I’m sure the big rig was in the correct lane their suppose to be in, but you have these idiots that think they can speed and cut in front of these big trucks with a lot of weight, causing them to slam on their breaks and slide. And as for the K-rail, yes, they are low in some areas, but why can’t people just slooooow down. METRO has trained, safe Operators driving these trains and as far as the system goes, it is SAFE!! It is those ninnies that always want to blame METRO for idiot drivers. The next question is, when did they allow box trucks in the car pool lane? There will always be ninnies–ask P.T Barnum. The idea is to build a transit system that is as ninny-proof as possible. Having a barrier that is so low one can crawl over it makes no sense along a +70 MPH freeway–although it is cheaper. Metro should rebuild the barrier into a “Berlin Wall” before one or more passengers or staff are maimed or killed. I’m riding today. Metro staff isn’t communicating with riders, a lot of people continue to look lost, are missing shuttles. The Arcadia transit is running on their scheduled times, not adjusting for the disruption on the Gold Line so we’re missing our connections. 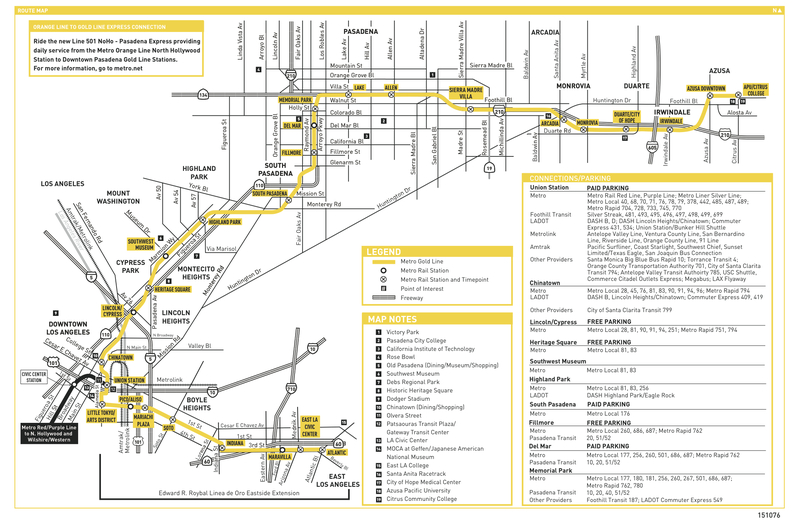 A number of potential riders at Azusa and Arcadia have heard about the disruption of service and have chosen not to ride… That negative perception of the Gold Line could be mitigated with more communicative staff at each station, whom should have been positioned throughout the first few days of service. It’s not Metro’s fault for the accident, though I hope Metro and Caltrans will investigate ways to improve safety on the 210 portion of the line… But Metro could be more communicative with their riders and with other agencies to ensure that disruptions can be minimized. Metro can do much better than this. This isn’t the first truck to jump the barrier and damaging the tracks in this area of the 210Fwy. Metro needs to do a study on what needs to be built to prevent another vehicle from causing damage to the rail line.. I believe it’s time to fortify the barrier along the freeway segment and add fencing as such on the green line. It will be a lot safer that way. Everyone needs to be thankful that this didn’t happen YESTERDAY on opening day. Graham Greenlee is 100% correct. We boarded at Mission Station, headed north excited to go to Azusa. Despite multiple PA speakers at the Mission Station, no mention of the service disruption; no mention when we boarded or at any stop until Allen. How disappointing that METRO, including the train operators, are so disengaged and tone deaf the very day after the opening. Almost half of the train did not get off as the primary purpose was to ride through, not wait for a shuttle bus. If a truck slams into a train, get ready for a huge lawsuit PAYDAY. Semi trucks have gone up onto the tracks in 2010, 13, 14, 16. Metro should know better than to have a 3′ high barrier on a 70+ mph freeway. It’s very sad that this accident happened at all, but if it was meant to be and it happened yesterday it certainly would have gotten the unvarnished attention of all the various stranded government / METRO officials who can get remedial work on the barrier done now–now buried in a budget request for the future. This may sound cynical and maybe it is, but I know from my years in government and transport service that the squeaky wheel does indeed get the oil. Let’s hope that the saying is proven wrong this time and the barrier redesigned forthwith without a major PR meltdown. Metro needs to work with Caltrans to upgrade the center divider walls to protect its properties and the general public. Why can’t Caltrans build a walls like they did on 710, 60 and the 105 Freeways. Speaking about the walls, the center dividers on the 110 Freeway is far too low. Trucks can easy land onto the bus ways and the stations. Each time when a vehicle or debris crash onto Metro’s properties. Metro needs to spend hundred of thousands of dollars to clean up and repair the damages. It is much more cost effective to build a 12-foot wall to prevent these type of problems once and for all. Metro is not the only agency who has this problem. BART’s MacArthur Station also is on the middle of the freeways and it has very little protection from truck crashes. Well, that didn’t take long. Maybe they need to make announcements when there is NO disruption of Gold Line service. Did somebody put a curse on this line? I was on the Lake Street platform at 6 am, and there was no information regarding the Gold Line service alert on the variable message system (VMS), just the Little Tokyo shutdown. When is Metro going to start using the platform area VMS to inform riders of recent and ongoing service disruptions? This is a pattern. Wow, there’s so much criticism for Metro today! You would have think they drove the truck. Metro did a pretty substantial inspection and repair job in under 24 hours. Very good work by Metro! PS. No idea how high a wall it would take to block a speeding freight truck, or how much it would cost. Chance of the annual crash happening right as metro rail passes by is still pretty slim. I can’t think of any bus or rail projects I’d be willing to cut to pay for it. I’m willing to risk keeping the wall where it is, especially so that people stuck in traffic can see the alternative speeding past. Great news that Metro completed the repair of the tracks for opening Work Day for the new extended rail line.. Hopefully, the ridership numbers won’t be impacted the downtime yesterday.. The key will be weekday ridership. The Sunday ridership was probably impacted, especially among those who wanted to ride it out of curiosity, especially those who, like myself, don’t live in the service area. Once both tracks are back in service, all should be OK. So did Metro actually fix the problem?? Because as of right now (3/8 @11:13am) I’m currently waiting at the lake station heading North/East (Towards Azusa/Citrus), and We were all just told that because one track is out of service, we have to wait for not one but two trains to clear our tracks before we can continue. Damage from the truck accident was repaired enough to open the line for Monday’s commute but some work continues, thus the single-tracking. I’m sorry about the delay and hope the train came quickly. I just caught a southbound train from Allen about 90 minutes ago — I know the spacing right now is different because of the work. With all the high tech built into the MTA rail lines there should not be a significant delay single tracking. Railroads seem to be able to handle the situation more efficiently where they only have a single track along portions of their lines.